Rey Mysterio need no intro if you are into WWE! He is often regarded as one of the greatest high-flyers in wrestling history. 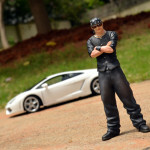 This is just natural that Matel would make figurines of this super star in scale that is almost near 1:18! This pretty boy came in a blister box and I have to damage the package to get access to him. 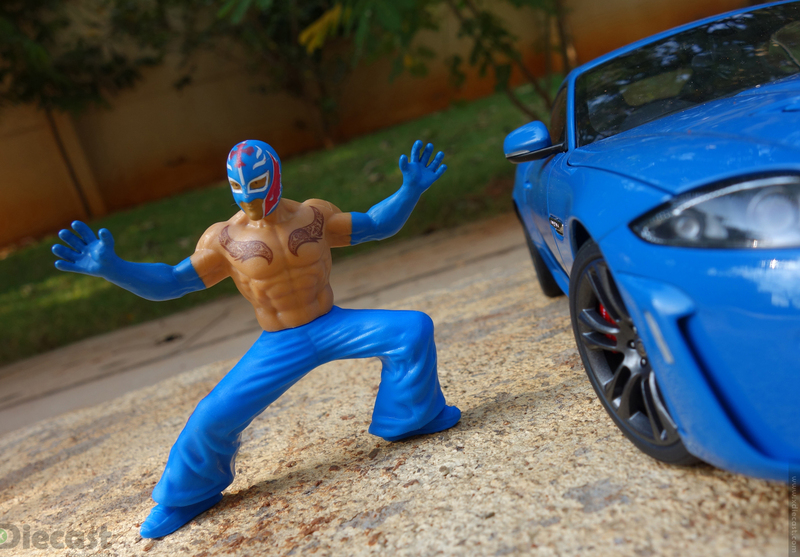 Though this Rey Mysterio has a list a fancy costumes the crafters have decided to make him in this blue costume with a matching blue mask, which is a very good choice! 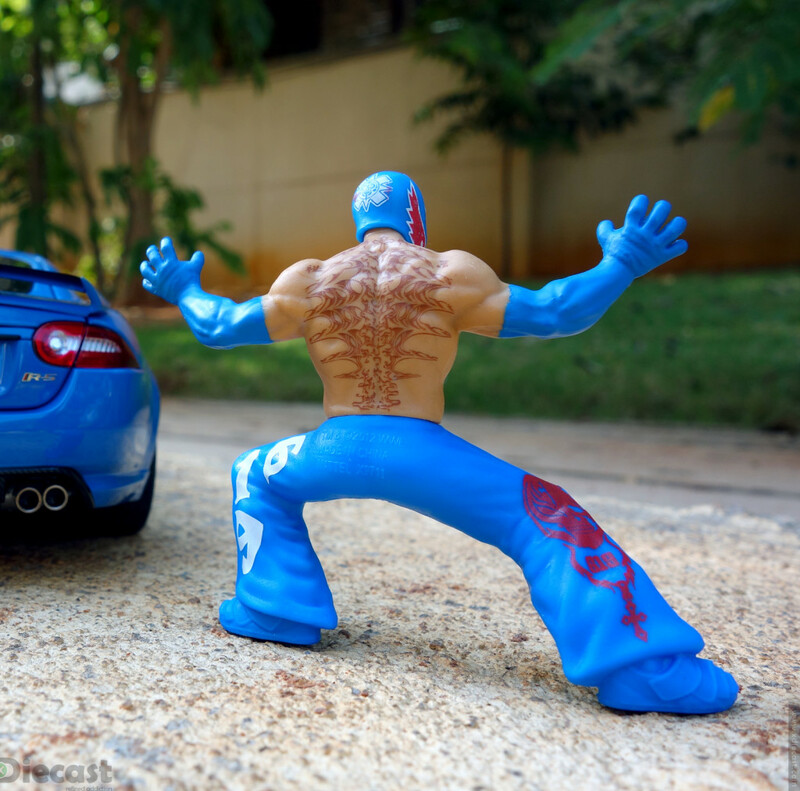 Being a Mexican-American wrestler he in this blue costume fits so well with this bright Jaguar XKR-S in French Racing Blue by AUTOart. Lets start this review with some pros… The figurine is solidly build and has a sort of heavy too in comparison to the other figurines that shares its podium space. 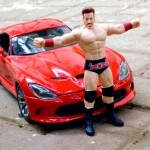 The skin tone is almost a matching the WWE super star’s skin tone… The best part about this figurine is the weight balance that lets this guy stand up snug even in some uneven surfaces! I like the figurines that stands up with out a base, makes it a best bet for dioramas! 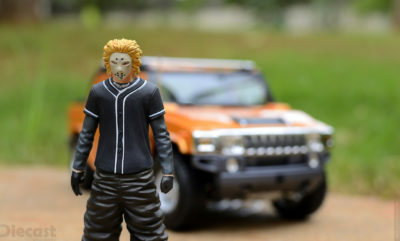 Finally the tiltable head that gives this static figurine some customization options. 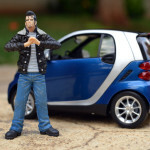 The figurine is sort of a basic model without articulating arms and limbs! 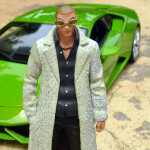 But I got him into my collection mainly because of this very quality, because if there were to be articulation then it should have joints so they shows up in photographs, which I don’t like! 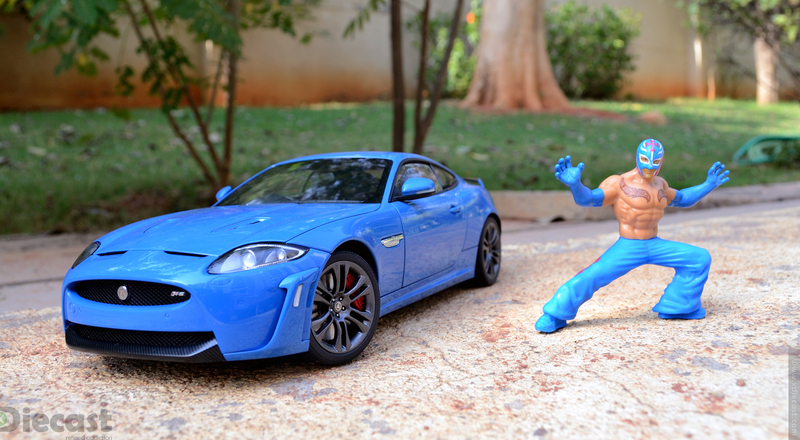 No articulation arms means no worries of those crude joints showing off! 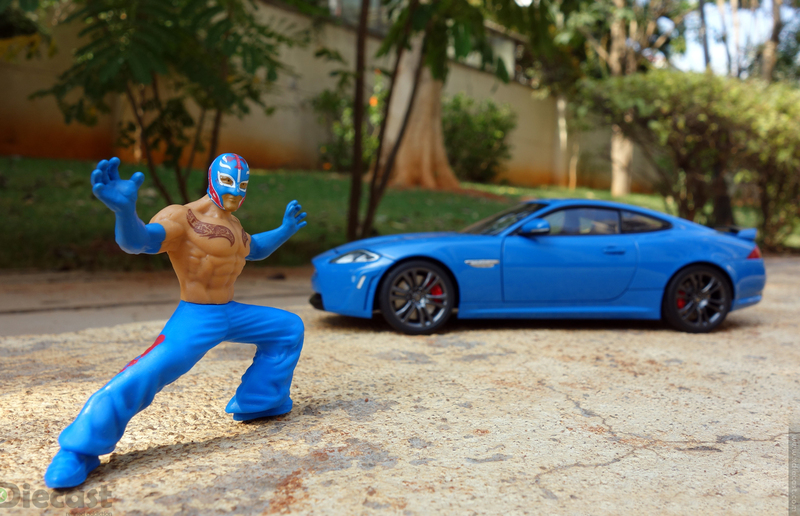 The blue costume of this Rey Mysterio figurine perfectly matches with my AUTOart Jaguar XKR-S in 1:18 scale and take that permanent place next to it in my Display case. 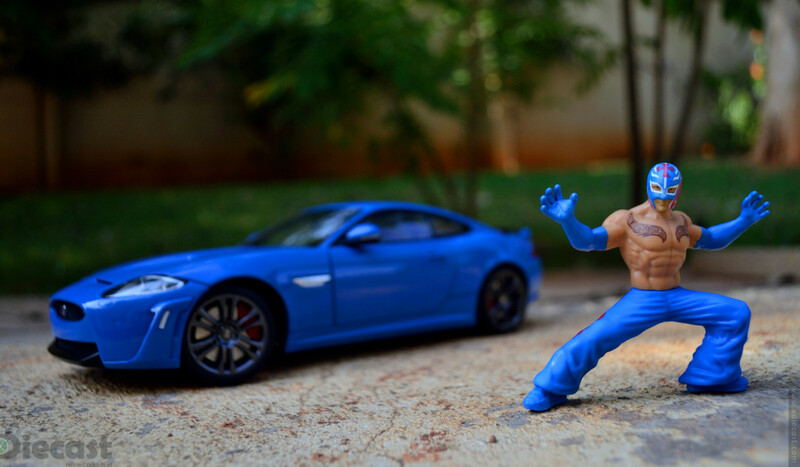 Even thought the head and the body can be twisted a little either ways, I wouldn’t call it articulation! What do you think? The best and the worst part of this figurine is the costume pattern and the tattoos on his body! Let me tell you why! I am not a big time WWE follower but I like these figurines for the sear fun of collection them… But even I could say that the mask that this guy comes with is not so authentic so as the entire costume! Add even the Tattoo to the list above. This Rey Mysterio figurine comes with its own array of defects but we have to consider the segment that caters to… Yes these are basically toys intended to kids to collect and play with so the material and parts scaling are all kept under check for safety, which might have caused some of these issues. Finish is a big bummer but not a deal breaker because if you place this figurine inside the display case it looks awesome. 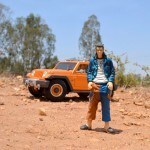 Finally the verdict is in favor of this figurine because of its value proposition and desiriablity. 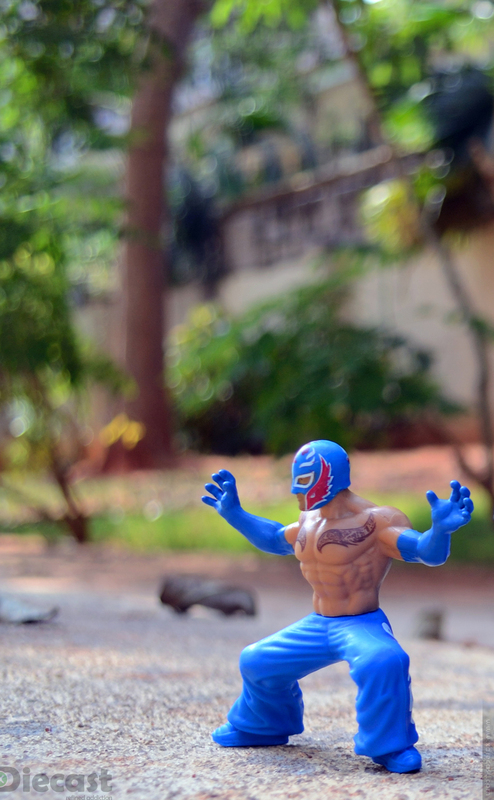 So I gave this Rey Mysterio Figurine a generous 3.5! Do suggest on changes to my review pattern and I will my best! Thanks for dropping by!